Watch the world’s tiniest Origami robot – builds, works and disintegrates itself. Researchers from MIT recently demonstrated an untethered miniature origami robot. This robot looks like a small piece of paper with a very small magnet on it, which self folds, walks, floats over water, and degrades when dropped into acetone solution. It does really follows complete human life cycle of birth, work and disintegrate. The origami robot and the actuation methods. (a) Outlook of the system. (b) The crease pattern. (c) Walking mode by torque-based control. (d) Swimming mode by force-based control. This robot is made of a magnet and PVC, weighs around 0.31g and measures 1.7 on a side. To bring it to life, what it all needs is a small heat source and there it is, getting life. In the above video, you can see the robot getting erected and performing its tasks like rotating, moving, floating over water, bearing weight and more, and at the end, it gets into a solution of Acetone and disintegrates iteself. 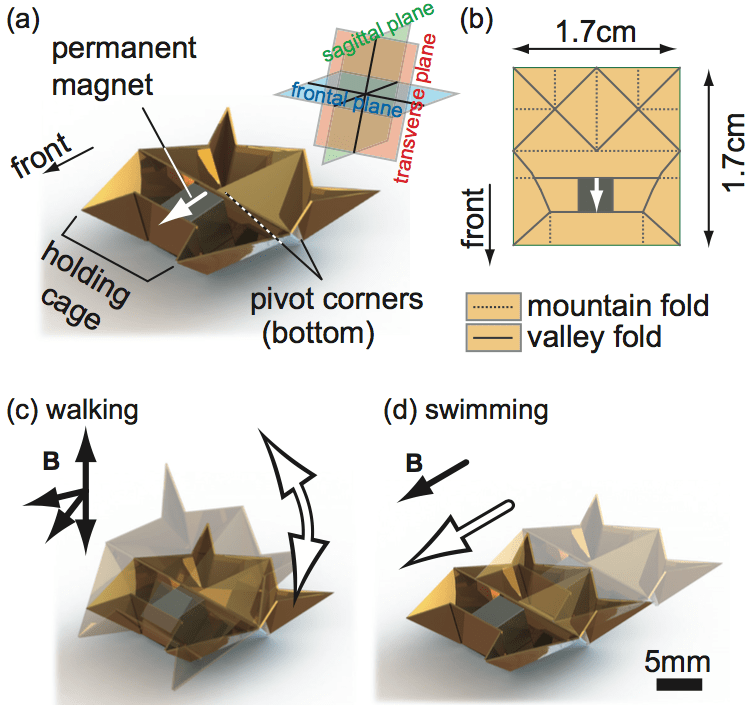 You can read more about this Origami robot from the article shared on IEEE spectrum.